Alfred Temba Qabula was born on December 12, 1942 in Flagstaff, Transkei. His father. a migrant worker, ‘coughed out’ the harshness of his life onto his children. He died after his drink was poisoned, Qabula’s mother wilted away early in his Life, leaving him to look after his brothers. Barely 18 years old, Qabula was caught up in the Pondoland rebellion hiding and starving in the forests. In 1964 he caught a train for Carltonville to work as a plumber. This trade took him to Durban, where, “fed up with doing skilled work for nothing", in 1974 he entered the noisy world of factory production at Dunlop composing songs in his head as he drove around on a fork-lift truck. In 1983 he joined the Metal and Workers Union, helping to organise Dunlop workers into the union. He participated in the "Dunlop Play" and in 1984 started to perform his "Izibongo zika Fosatu" at union meetings. His performances initiated a revival of imbongi poetry throughout South Africa, as workers have transformed this tradition into a powerful expression of their struggles. 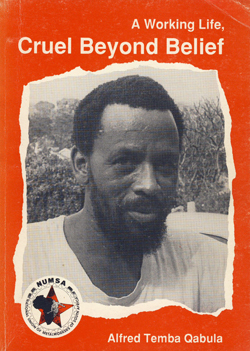 In 1986 a collection of his poetry was published in 'Black Mamba Rising", along with poetry by worker poets Mi Hlatswayo and Nise Malange. It won the Norwegian Literature Award in 1987. Qabula now works for the Culture and Working Life Project at Natal University spreading his skills and enthusiasm through the unions in the region.